At Burfords we pride ourselves on our professionalism and for this reason we make sure that first and foremost we have the right equipment to do the job properly. Most so called professional companies will have only one cleaning machine which is usually just a portable electric water extraction machine and claim that they are able to do a good job regardless of what they are cleaning. The truth is that no one single system/machine is capable of effectively cleaning every type of carpet. That’s why at Burfords we have invested in excess of £50,000 in cleaning equipment From our State of the art Truck-mounted steam cleaning machines through to our Low moisture encapsulation cleaning systems and just about everything else in-between. Having the right equipment is just the start however as without the correct cleaning chemicals and by that I mean Licensed trade chemicals not off the shelf detergents and without the knowledge and experience to use them properly then you may as well hire a machine yourself, as the results will be similar. 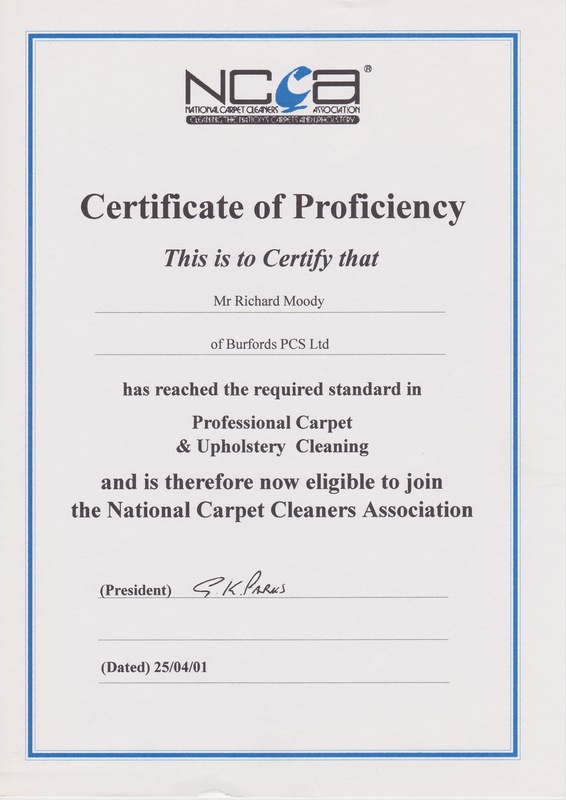 This is why all of our staff have undergone rigorous training and have qualified with the Industries leading governing bodies the N.C.C.A (National Carpet Cleaners Association) as well as the I.I.C.R.C (Insitute of Inspection Cleaning and Restoration Certification).